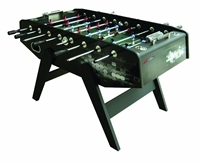 The DMI Sports United 52" Table Soccer will provide hours of fun at an affordable price. 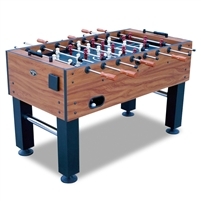 This table comes with 4" legs and crossbars, 1/2" solid chrome-finished rods, brightly painted players and a light oak finish. 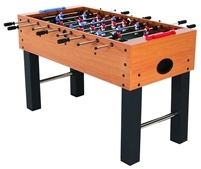 The G01342W Atomic ProForce Soccer Table features 13⅞-Inch x1-Inch MDF aprons w/ bamboo laminate for increased strength, 5/8-Inch chrome hollow steel rods, and rubber octagonal handles for an easy and comfortable grip. The play field is made of 1/2-Inch thick MDF and the hollow steel rods include robot style men. 4⅝-Inch L-style leg laminated MDF feature 3½-Inch leg levelers that help offer balanced and consistent play too. 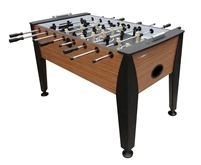 The Maverick foosball table combines a commercial grade cabinet with proven technology to provide years of high-caliber game play. Built like a tank, the Maverick boasts a one-inch thick mahogany cabinet, solid one-piece molded legs, solid steel rods, and a 3/4 inch thermoplastic play surface for unmatched durability. Show off the Maverick's streamline design with no visible bolts on the table's exterior and color Viper logo on play surface! 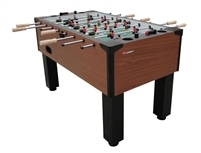 The G01354W Atomic Eurostar Soccer Table features 14-Inch x 1-Inch MDF aprons for increased strength and octagonal shaped handles made of soft touch rubber for an easy and comfortable grip. The 5/8-Inch x 1 1/2mm chrome hollow steel rods display -InchEuropean-Inch style men. The 3/8-Inch thick play field features a 1 1/4-Inch support brace and the 5 1/4-Inch tapered legs with 1 1/2-Inch levelers help offer balanced and consistent play too. holders. Tapered spectator apron for better play and surface visibility. are hollowed for faster play. 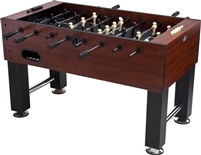 The Agean Foosball Table combines a classic and stylish look with the greatest features for maximum game enjoyment. 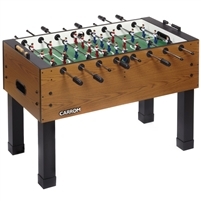 The foosball table's hand painted players complements its classic design. The play surface is 3/8" thick with screen printed graphics using enamel for wear resistance. Cushioned rubber handles allow for precise player control. 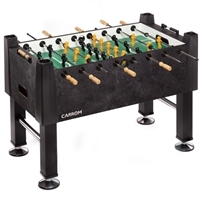 The G01889W Atomic Gladiator Soccer Table features a massive 15-Inch x 2-Inch MDF aprons built to withstand years of aggressive play. Solid steel chrome rods are 5/8-Inch in diameter ,and feature nylon bushings for faster play. Octagonal handles are made of solid wood and the 4 3/4-Inch x 4 3/4-Inch post legs offer increased stability and more solid play, while the 3 1/2-Inch leg levelers help offer balanced and consistent play too. The Signature Carrom Foosball Table is designed to stand the test of time for durability and play value. The reinforced play surface ensures a flat field for consistent ball roll without the warping effect of games made with lesser grade materials. The table legs are reinforced with double bolting and include chrome support bars and leg levelers to ensure a level field and eliminate dead zones for maximum stability and durability. Superior quality triple chrome-plated steel rods paired with stay-true rod bearings increase response speed and provide self-lubrication with long lasting durability. Choose one or three goalie play, decided during your assembly game set-up. Corner ramps are included for the single goalie assembly. Includes wood bead scoring in natural and black and eight-sided hardwood handles which allow for precise player control.